Dutch astronomers have found clear evidence that a faraway exoplanet is falling apart. New analysis of data from NASA's Kepler satellite shows that this exoplanet, which orbits its host star every 16 hours, has a massive dust tail originating from its surface, similar to a comet's tail. The study will be published in the journal Astronomy & Astrophysics. The Kepler satellite is looking for planets around stars other than the Sun, known as exoplanets, since the spring of 2009. When an exoplanet moves in front of its host star, the starlight is dimmed by a small amount. By looking at over 145,000 stars simultaneously, Kepler can find these rare exoplanet transits and thereby detect thousands of exoplanets. Earlier this year scientists in the US found a mysterious object among the stars observed by Kepler: instead of constant, periodic dimming due to a transiting exoplanet, KIC 12557548 shows periodic dimming that strongly vary in strength. This led to the speculation that the variable signal may be due to an exoplanet that is slowly falling apart. Now, a new, much more detailed analysis of Kepler data clearly shows that starlight is scattered by a large dust cloud that trails the planet. So far this is the only known exoplanet of its kind. "The exoplanet is very close to its central star", explains Matteo Brogi (Leiden University), lead author of the study. "Because it is so close, the surface of this exoplanet is very hot, about 2000 degrees Kelvin. This leads to very strong internal motions in the planet, which in turn leads to massive volcanism and erupting ash clouds. Some of this dust escapes into space where the intense stellar radiation quickly evaporates it. 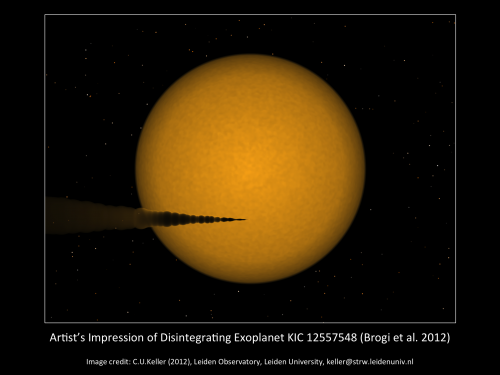 The variable amount of dust leads to the observed variability in the star's dimming." Christoph Keller (Leiden University), co-author of the publication adds: "By observing the dust clouds in different colors, something Kepler cannot do, we will be able to determine the amount and the composition of the dust and estimate its lifetime. As the evaporation peels the planet like an onion, we can now see what used to be the inside of a planet". I'll have my exo-planet well done, please.